Miley Cyrus recently went on record as someone who refuses to define her own sexuality: “I’m not hiding my sexuality. For me, I don’t want to label myself as anything… There are times in my life where I’ve had boyfriends or girlfriends.” Considering that she’s still one of the biggest pop stars in the world, that’s a bold move. And she’s also started the Happy Hippie Foundation, an organization to benefit homeless and LGBTQ young people. 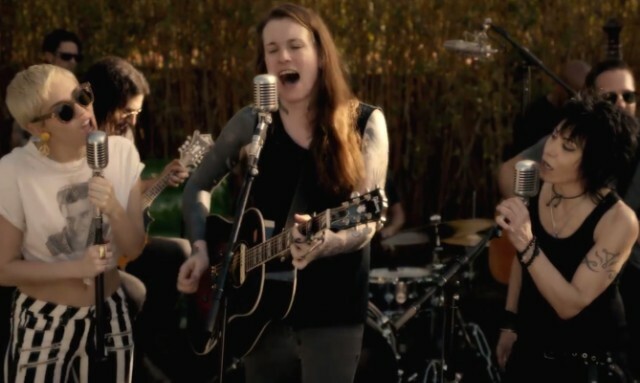 As part of that effort, she’s posted a video of herself, in her backyard, playing a countrified cover of the Replacements’ Let It Be classic “Androgynous” with a couple of androgynous icons, Joan Jett and Against Me! frontwoman Laura Jane Grace. (This must be what Cyrus and Grace were working on all along.) It’s maybe not the best cover in the world, but this is goddam Hannah Montana we’re talking about. The mere fact that this video exists is pretty amazing, and so is its reason for existence. Check it out below. Cyrus promises more Backyard Sessions videos on the way.